Busulfan is an alkylating agent commonly used in the treatment of chronic myelogenous leukemia and in combination with cyclophosphamide in preparation for allogeneic bone marrow transplantation. Serial treatment of a childhood high-grade glioma xenograft (D-456 MG) with busulfan resulted in a busulfan-resistant xenograft, D-456 MG(BR). 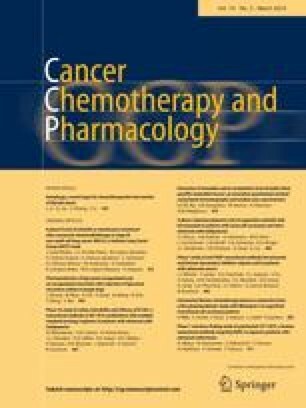 Cross-resistance to 1,3-bis(2-chloroethyl)-1-nitrosourea was seen but not resistance to cyclophosphamide or CPT-11. Cytoplasmic levels of glutathione in D-456 MG(BR) were approximately one-half those found in D-456 MG. This depletion could not be explained by levels of glutathione-S-transferase, or by amplification, rearrangement, or increased levels of transcript of γ-glutamylcysteine synthetase. Furthermore, depletion of glutathione in D-456 MG did not alter busulfan activity. Quantitation of busulfan levels in D-456 MG and D-456 MG(BR) xenografts following treatment of mice at the dose lethal to 10% of the animals demonstrated that significantly lower levels of drug were achieved in D-456 MG(BR). These studies suggest that alterations in drug transport or metabolism of busulfan may play a role in the resistance of D-456 MG(BR) to this alkylator.